Anonymous Shirdi Sai Devotee from India says: I am part of Mahaparayan group MP-541. 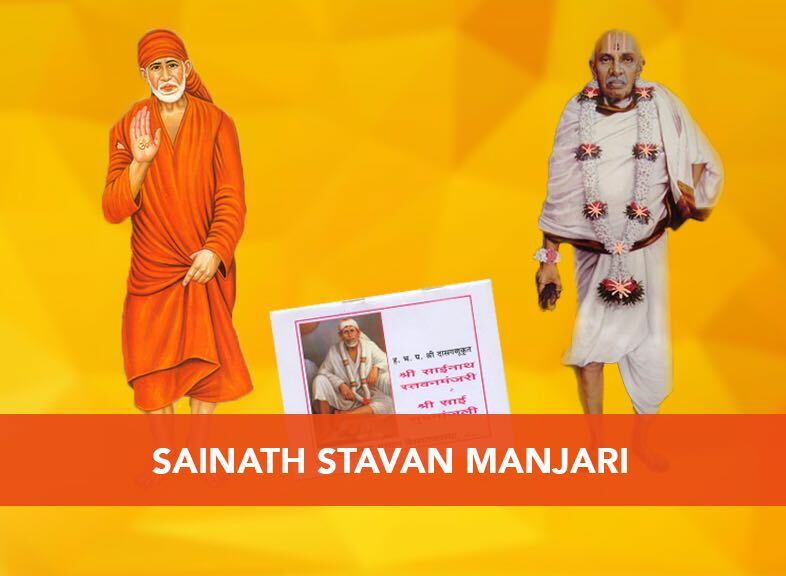 My husband is a Sai devotee and through him I started worshipping Sai. I have many miracles from Sai. Most of the good news I hear on Thursdays only. I want to share one of my recent experience. I lost one of my very important documents and I searched for it almost 2 months for it. I couldn’t find and applied for a duplicate. Status came Thursday, all good happens to me mostly on Thursdays. When we opened, first time I saw rejection and was shocked. 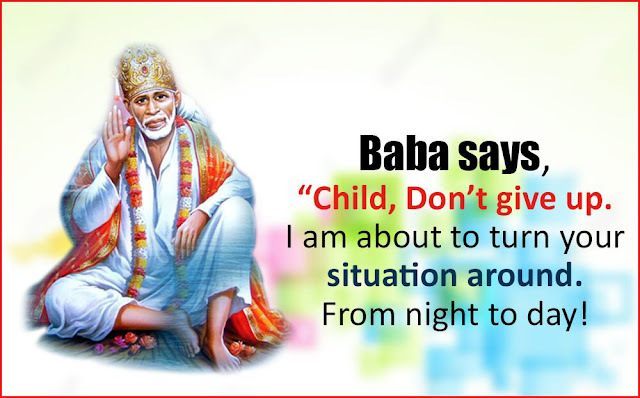 Thought of Sai asking why You rejected Baba, I didn’t expect it. And then I started Mahaparayan. On second Thursday my mind said why You are searching alone? Ask for Baba’s help. After parayanam I asked Sai, I couldn’t search all by myself, at least help me find my original by next parayan day and I stopped searching for it. Shirdi Sai Devotee Sangi from USA says: I am a Shirdi Sai devotee from MP 234 group. I am a Sai devotee for many years and experienced many of His miracles. In August 2017 I visited our dear Sai with whole family. I am away from India, no idea about Shirdi place as I am South India, don't know Hindi as outside India for many years. I had strong wish alone to see our dear Sai. I browsed Internet, found travel agency who arrange for all tours, contacted them and made all the arrangements. Finally I informed my family members back home as my brother and sister-in-law are working. For my brother leave got approved immediately but for my sister-in-law it kept postponing. I kept praying to Baba please call all us together as a family. Her leave got approved one day prior to our travel day. Finally we all had good darshan of our Sai. We spent almost 3 days in Shirdi. I am sharing my second experience in this one year of Mahaparayan. Few days before we suddenly got news that my father-in-law expired and hence we rushed to India. While leaving USA we were scared that what will happen if we do not get our stamping done, but since our family condition was so critical we traveled with hope that God will take care of everything. I visited Sai Baba's temple almost every Thursday near my house in India. When my husband submitted all the documents I prayed Baba that I want my stamping to be done without any obstacles that too within a week. I prayed Baba that if I am doing His Parayan and Sainaam Jaap with full faith then I should get my stamping news within a week. Baba answered my prayers and my stamping was done without any obstacles in 3 to 4 days. I am still doing Sai Naamjaap, along with Mahaparayan and have faith that Baba will pull me and my family from all the problems and challenges that we are facing. 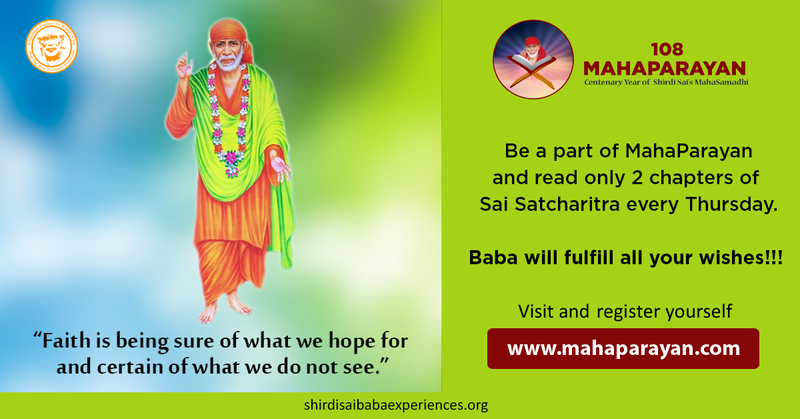 By Sai Baba's grace, I will soon share my next experience with everybody. Naamjaap is the easiest and one of the most effective and recommended sadhana in this Kaliyuga. It can take us even beyond this materialistic bhavsagar (ocean). None can be like You Deva - The Greatest Saviour ever. Love You Deva. Jai Jai Ho Sai. Shirdi Sai Devotee Sowmya from India says: Sai Ram. This is Sowmya from Mahaparayan MP-136 group. I got to know about Mahaparayan group through my aunt Geetha Venkat. For past 17 years Baba has always been an inseparable soul of my life. He has been guiding me through various types of intuition like dreams, voices, question and answer website (www.yoursaibaba.com), etc. And everytime, be it warnings or positive signs Baba have pre told me which resulted in averting adverse disasters, and careful handling of situations of life to achieve success at different stages. It was the time when I had joined job and was with intense pain as I couldn't do parayan like previously and Baba heard my prayers. One day my aunt pinged me and explained me about Mahaparayan and she said me, "You are added in the Mahaparayan group and now I am informing you, I know you will be very happy so without even asking you I gave your name to Neha Dhanpal". 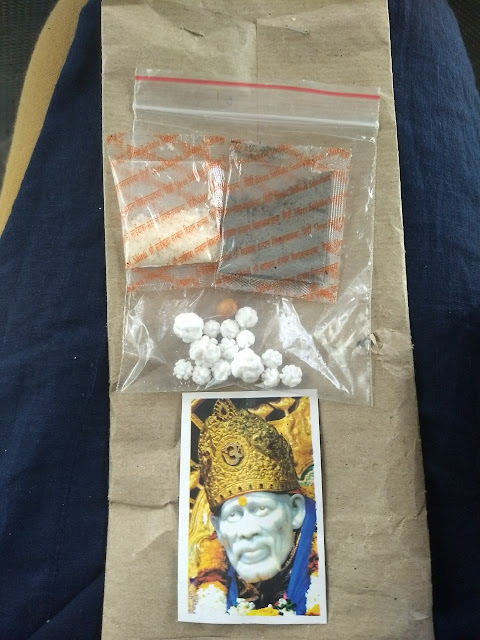 Shirdi Sai Devotee Lavanya Prabhakara from India says: I had a headache since morning due to an acidity attack (had an early day, participated in a puja, late lunch etc) I thought I was getting better by evening but apparently got worse and vomited. There was so much discomfort so decided to go out for a walk to breathe some fresh air. On the way back I finally prayed to Baba to relieve me from the pain immediately and that I will post the experience on the Mahaparayan site. Shirdi Sai Devotee Rashi Vashist from India says: Om Sai Ram. I am from MP- 210 Mahaparayan group. I believe in Baba very much. Whatever I have asked Him for, He has given me. And He has given what is best for me. I have full Faith in Baba. 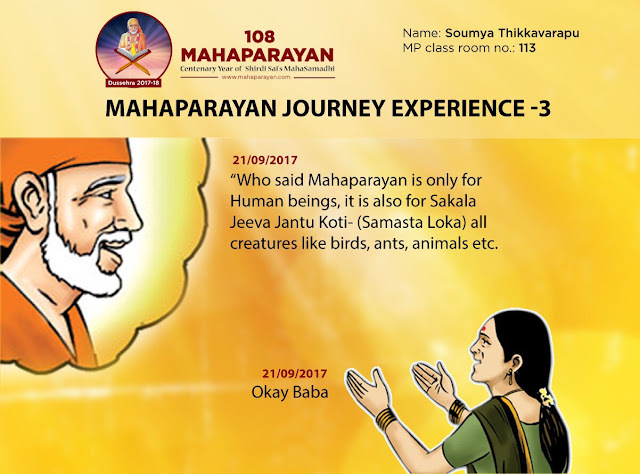 Before I had shared one of the beautiful experiences with you all which has been posted in Mahaparayan Blog on 19th May 2018 as "Baba's Dream Saying Mahaparayan Is A Blessing And Boon To All Sai Children", if anyone have missed reading can read it, and here I wish to share one more experience with you all. On 28th march 2018, I and my boyfriend were waiting for an auto and none of the auto stopped. Then suddenly an auto came, with whom I asked for the fare, he said as 70 Rs. First we were required to go to the Metro because I had to drop my boyfriend to Metro Station and then after that I had to go to my house. When I checked my purse I found only 60 Rs but the auto driver said that auto fare as 70 Rs. So I asked him, could you take 60 Rs for auto fare? He agreed. Then I checked my purse and found some change, in total it was 10 Rs, means all in there was 70 Rs. in my purse. Anonymous Devotee of Shirdi Sai Baba says: Please keep my name anonymous. Thank you Poojaji, Jai Sai Ram! Baba thank You for everything You have done for us, I cannot thank Yyou enough... koti koti pranaam. Love You Baba. Last year as schools began, as every parent, I was excited for my son to start 2nd grade. Unfortunately, he got a teacher who was very laid back and not experienced, since she lacked the experience she would let things go and not focus on teaching kids in class. Shirdi Sai Devotee Sandhya from USA says: Om Sai Ram. I am part of of the 365 days of Mahaparayan and feel extremely blessed to be able to read a chapter every day and it has become my daily routine now. My day is incomplete without the daily reading and I look forward to my chapter allocation as I feel Sai Samarth always answers my queries, doubts through the daily chapters. I have been wanting to share this experience of mine from sometime now but I think Sai has chosen it now hence the delay. During the month of December 2017 one morning I woke up to get a call from India that my father-in-law was very sick and admitted to hospital. The doctors had given up hope too. My husband was very disturbed and started for India immediately leaving me and my son here in USA. Anonymous Shirdi Sai Devotee from India says: Sairam. 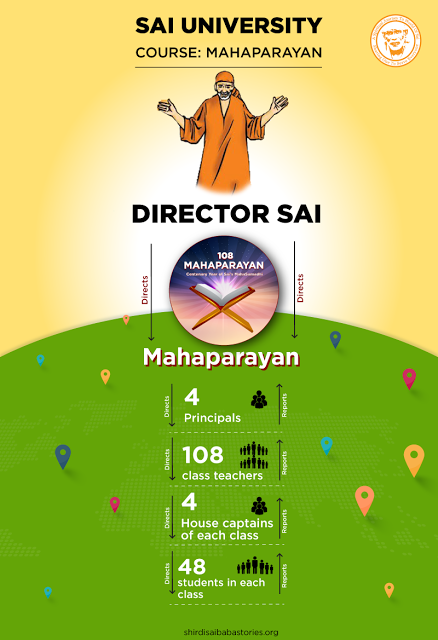 I am feeling very blessed to be a part of Mahaparayan, which brought me so closer to Baba and also transforming my life. My heartfelt thanks to each and everyone who are working hard to make it successful. Only after Mahaparayan, I heard about Das Ganu ji’s Stavan Manjari and the first time I read it. It was divine bliss to read. I still remember it very clearly. The way Das Ganu ji has penned down and have praised Baba have made a deep impression in my heart and my respect grew for Das Ganu ji. Only then I realised the statement that Baba is most pleased when His Disciples are honoured. Anonymous devotee of Shirdi Sai from India says: Om Sai Ram to my Sai family, today I want to share biggest miracle of my life. I’m working in government sector on a contract basis and with Baba’s blessings I was availing all the facilities and emoluments equivalent to regular employees. But from 2015 seniors at our office played politics and slowly slowly snatched our basic rights due to which we were facing a huge financial loss till now. We also filed a court case. Suddenly 15th feb 2018 Thursday my anniversary I was in Shirdi and prayed to Baba and read my Mahaparayan chapters there also. Court hearing was due on that day but hearing didn’t happened but our Board took positive decision in our favour. This was Baba’s miracle and things started becoming positive from that day and in June 2018 I got my regularisation order, that too without leaving sugar. I am a regular govt employee after 11 years of service. Not only me but around 400 colleagues of mine are benefitted.Thanks to my Guru, my Guide, my God. Thanks is a small word Baba. My merciful God only You can do this. Shirdi Sai devotee Kavitaji from India says: My name is Kavita and I am from Hyderabad. I am a part of Mahaparayan M-219. I am a devotee to my Sai since 2006. I have experienced many miracles of Baba where He has made me feel that He is always with us. Baba called me first time to Shirdi on the day of Dussehra. Me and my family were unaware of the importance of Dusshera in Shirdi. We got to know only after reaching Shirdi that Dussehra is one of the festivals celebrated widely, as the same day Baba took Samadhi. We found ourselves so lucky that He made us a part of this day. I have long list of Baba's leela which I will surely share in my next post. 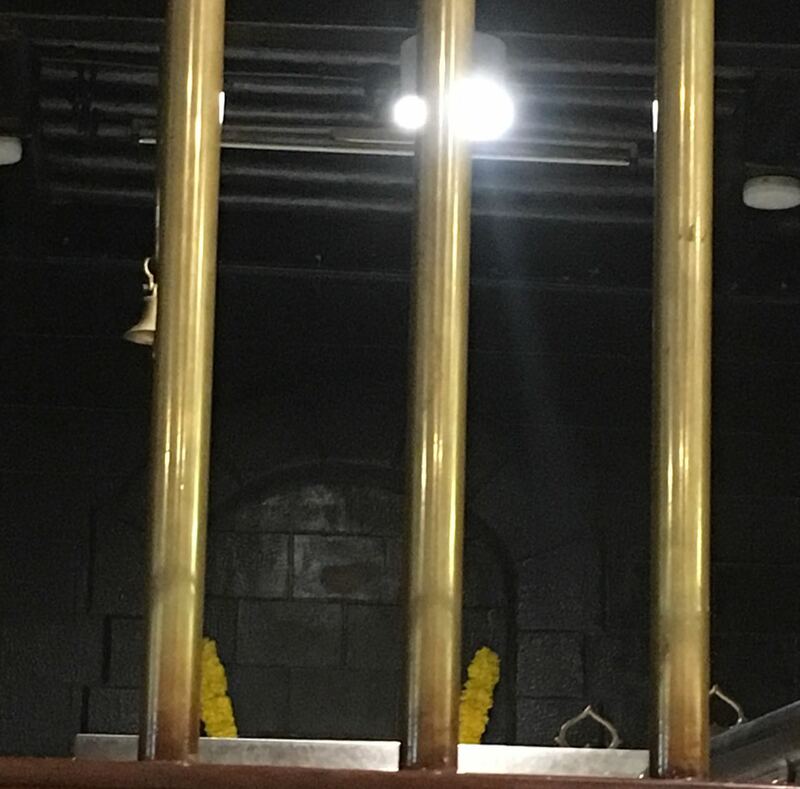 My recent experience was on 23rd Jun'18 when me, my husband, and my 5 years old daughter were supposed to travel to Shirdi. This was a sudden plan. Our train was in the evening and we were supposed to reach Shirdi next morning. On 23rd morning my daughter had stomach pain and vomiting. Anonymous devotee of Shirdi Sai from India says: Sairam to all. I am from MP-16 Mahaparayan group. First let me thank from bottom of my heart to Pooja ji for giving me an opportunity to be a part of various Sai sewa’s and groups. May Baba bless you and your family. I have been wanting to write and share this experience with all since quite sometime now, but as you know that all our actions are ruled by only our Baba and His timings are perfect so I surrender the act of doership and take it as His wish and think that He wanted me to share this experience may be today and it could be for inspiring someone who’s situation is like mine. Baba,I completely surrender my this writing in Your holy feet. Shirdi Sai devotee Vimitha Vasu from UAE says: Sairam to all my Sai Bandhus. I am from MP-77 Mahaparayan group. First let me thank from bottom of my heart to Hetal Di and Pooja ji for giving me an opportunity to be a part of BMP Khichadi 4am Parayan. May Baba bless you and your family. Today was my first day in BMP Khichadi Parayan. Wholeheartedly, I prayed Baba to wake me up at 2:50 am, I woke up but slept off. Here wonder of wonders!! Baba came and alerted me through my son, he called me "Amma wake up". Then I woke up. After taking bath, lit a lamp and kept Khichdi for cooking, completed my parayan and I prayed Baba to accept the Naivedya. Shirdi Sai Devotee Nirupama from India says: Om Sai Ram. Iam Nirupama from MP-58 Mahaparayan group. Dear Saibandhus, I am so happy to share one more experience with you all. Thank You Baba for being with me and giving me strength to face anything. Today morning I received Shirdi Sai Baba's Prasad and Baba's Photo from one of our Saibandhu during Mahaparayan (attaching the picture). I had prasad, and as usual on the way to office I was looking at whatsapp group messages and was stunned to see the below message. Anonymous devotee of Shirdi Sai from India says: Om Sai Ram. Sairam all Sai devotees, Want to share unbelievable Baba's miracle. Baba's ways are unfathomable. We have to wait till He answers and believe in His timing completely. My parents have been struggling for my marriage, I'm also suffering by seeing them. By Baba's grace, I'm in MP, 365DP, BMP (Brahma Muhrat Parayan), VSP, SMP, AASM as I tried many activities of Baba And cried a lot in front of Him. Finally, Baba heard our prayers and showed His grace on me and my family. Anonymous devotee of Shirdi Sai from USA says: Om Sai Ram. Om Sairam Pooja ji, Hetal ji and all the devotees who work relentlessly to gather all devotees and strengthen our faith in dear Baba. I am blessed to be a part of MP-128 Anusha Sai Mahaparayan group and a volunteer in AASM Wednesday Mahajaap group. Since the beginning of June, we have viral infections going on in the family, my 7 year old had cough and cold, then my parents and mom -in -law. It got passed on to me and then my husband. I had almost recovered but all of a sudden on Tuesday (19th) morning, I started throwing up. I threw up almost 6-7 times and was very feeling very weak. I somehow managed to get by the day and after a good night's sleep felt a little better. Shirdi Sai Devotee Mrs Andal from India says: Om Sai Ram. I am Mrs Andal from India.I want to share my recent Mahaparayan experience on this blog. About 25 days back my neighbour went to Shirdi to have Darshan of Lord Sai Baba, I gave her 100 Rs and I asked her to get me a packet of Udi. To my surprise Baba sent me 10 packets or more even without collecting 100 Rs. I asked only 1 but He sent me 10, this how He shower blessings on His devotees. Shirdi Sai Devotee Rekha Goyal from India says: Sairam everyone. I am Rekha Goyal from MP-1 Shwetha Sai Mahaparayan Group of first University. Baba has His own unique ways to show us His leelas and bless us with His presence each time, which will ever remain with us in our life as wonderful experiences. I would be very happy to share two such wonderful experiences which have happened with my sisters last year during Mahaparayan. When we had started our Mahaparayan, I always used to tell Pooja that you are taking such a lot of efforts to conduct Mahaparayan at Global level, but what is the guarantee that devotees will do the parayan sincerely and report it honestly after completion? I always had this question in my mind but Pooja used to tell me "Don’t worry Mamiji, leave it to Baba and surely He will take care. We will do what we can do at our best. If anyone lies then Baba will see them and with a smile say that mamiji it is Baba’s headache. ". And to my surprise this came out true. Yes! Baba takes care of each and every little thing that we can’t even imagine. After all He is the Almighty. Starting from reading our allotted chapters till reporting and completion of parayan Baba takes care of it. Shirdi Sai Devotee Nirupama from India says: Om Sai Ram. Iam Nirupama from MP-58 Mahaparayan group. Dear Sai bandhus, I want to share the experience about Baba's darshan in my dream. Today morning I had a dream, where I met few of my friends and we all went to different places. I couldn't remember the dream completely but we were in a place where some illegal things were going on. We escaped from there and reached a sea shore. Suddenly there was flood all over and we were worried. We started running. I was thinking of Baba and seeking His help. I could see Baba in the sky in the lightning. I could clearly see Baba's face in three different variations. I was so happy to see Him and was in tears. I was thanking Baba for giving me His darshan. I continued praying Baba looking at Him in the sky. Suddenly Baba merged in me( Though it sounds silly this actually happened in my dream). I felt so blessed. Shirdi Sai Devotee Deepti Agarwal from India says: Sairam to all devotees. 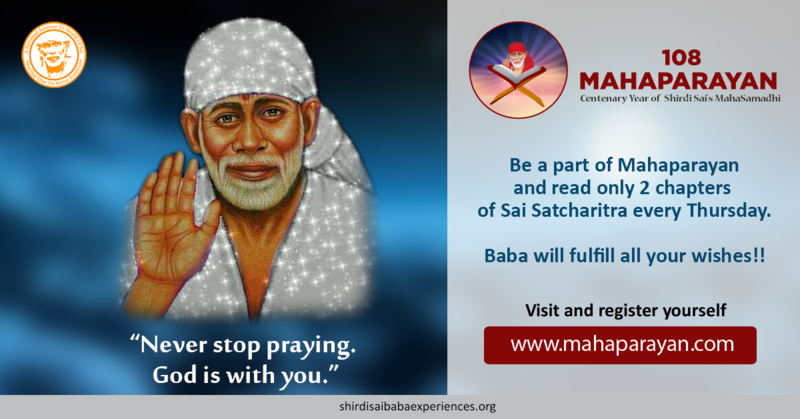 My Name Is Deepti Agarwal and today I am sharing my beautiful experience with all my Sai devotees which will undoubtedly multiply your faith many, many folds. I am married since last six years and ours had been a love marriage. We have one daughter who is 4 years old now. 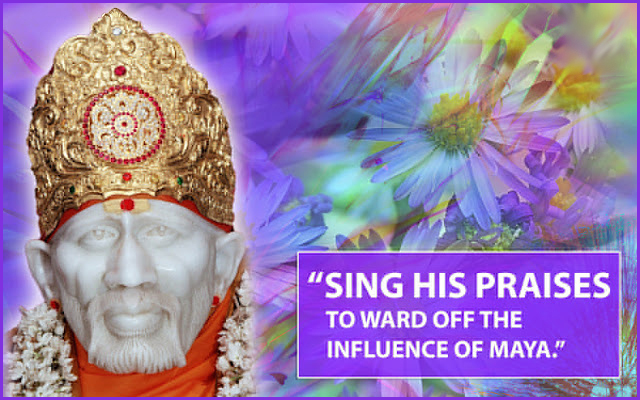 I had faced problems in my married life but now everything got solved all because of my Sai Maa. My parents got me to their place after 3 years of my marriage as I was facing lot of problems at my in-laws place. I was there for 3 years but only starting 6 months of my married life were good, rest was a torture life for me. I never informed my parents about my problems that I was facing. But one day they came to know as we met in one family function as there they saw my condition and the very next day they came to my in-laws place and took me and my daughter. Then days went on, I got job and I started working. Shirdi Sai Devotee Manjula Singh from India says: Om Sai Maa. I am from MP- 44 Mahaparayan group. Baba is so merciful. He can never see His children in pain, He comes running and cures them. I want to share one of my experiences that took place yesterday. Day before night due to some allergic reaction I had swelling in my gums and blisters in my entire mouth. The pain was so immense that I could not sleep the whole night and kept chanting "Om Sai Rakshak Sharanam Deva". Morning I woke up with the same pain and went to the doctor. The pain didn't reduce even after taking the medicine. I was just not able to eat anything and felt like my head will split. I went in front of Baba and cried saying the pain was unbearable and I have to take care of my son too. With tears I applied Udi and mixed little in the water and drank the same. Not less than 10 minutes the pain subsided and today there is no trace of blisters. Shirdi Sai Devotee Palivela Sri Vidya from India says: Sairam. I would like to share my experience about how Baba blessed me to read Vishnu Sahastranaam. When I was in the break period of my job, while doing Satcharitra Parayanam I got an online message from Baba to read Vishnu Sahasranaam. And that day evening while removing other pooja book unknowingly I was even holding Vishnu Sahastranaam. From that day I started reading it thinking it as Baba's order. Shirdi Sai Baba devotee Sunitha Dinesh from US says: Om Sai Ram, I would like to share couple of more experiences of our loving mother Saima, and it goes as below. 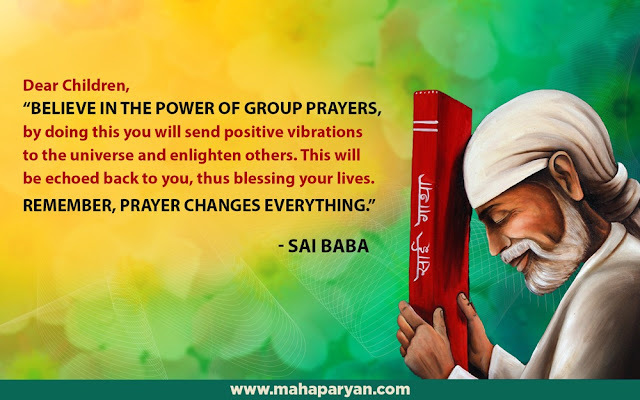 On May 9th, Baba blessed me to join 41 Saptaah Parayan group. Shri Sai Baba has given an idea to spiritual coordinators to start 41 Saptaah Sai Satcharitra Parayan (through Sai Anugraha Spiritual trust). As the name is self-explanatory, it is 41 weeks of Sai Satcharitra Parayan starting from 4th Jan 2018. 1st week Parayan has started on 1st Thursday in 2018 i.e. 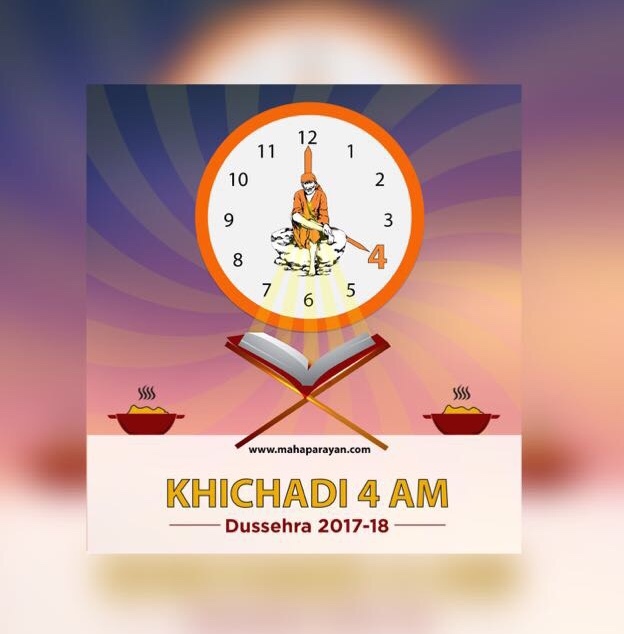 4th Jan 2018 and 41st week of parayan ends on 17th Oct 2018 which is last Wednesday before Vijaya Dashami. Shirdi Sai Devotee Archana Gillala from India says: Om Sri Sai Ram to all the Sai family members. I was introduced to my Baba by my parents at a very early stage. I would fight with Baba and say sorry to Him after the fight, share my good and bad things with Him and keep talking to Him, Him whom I saw in a small pic on my table. Soo lucky to be connected to Him by His grace. I read so many experiences and talked to Him again. I said every one of them are having a kind of experience when they started reading the book (Satcharitra). Could you please give me one such experience to share specially for this blog, though I had innumerable ones from my childhood. Shirdi Sai Devotee Muskan from India says: Sairam. This is Muskan of MP-23 Sukrity Mahaparayan group. Seeing many experiences of Baba Sai coming in dream and talking to His Bhaktas and assuring them all that "He is always with us", I was also waiting for that night where Baba will be in my Dreams too and talking to me more and more. With His grace, that Fruitful Night with full of His Blessings is captured in my memory too. Help me Deva to pen down Your Blessings. My dream goes like this, I saw Baba sitting in stone posture (Baba's sitting posture) wearing White Kafni having His right leg on left knee and His left hand fingers on right Charan toe. He is sitting under a guava tree of my ground. I bowed down to have His blessings. I sat down on my knee with my brother (in my dream as I was with my brother), touched Baba's feet and then I placed my hand on my head as we all do pranam (while taking ashirvaad). I don't know exactly what He told but what I figured goes like this, Baba said "Tum Khush Tho ho na" (You are happy right). I said "Baba apna haath mere sar pe rakhiye na" (I said Baba to put His hand on my head), He did the same. Then, He said to me "Udi le lo" ( take Udi) and points out to a corner where there is lump of Udi and I saw that I have taken Udi from there. My dream ended here.